To evaluate changes in serum lipid parameters (cholesterol, HDL cholesterol, LDL cholesterol, triglycerides, and lipoprotein(a) [Lp(a)]), in postmenopausal women receiving letrozole after tamoxifen therapy. MA.17L is a sub-study of MA.17, a double-blind, placebo-controlled trial of extended adjuvant letrozole. Eligible postmenopausal women were non-hyperlipidemic and not on lipid-lowering drugs. This analysis considers the 183 patients on the letrozole arm. Lipid parameters evaluated at baseline, 6 months, 12 months, and yearly thereafter until completion of 5 years of letrozole. The median duration of letrozole treatment was 5.0 years with a range from 0.03 to 6.05 years. After 5 year tamoxifen, patients on letrozole experienced significant increases from baseline in total cholesterol, LDL cholesterol, and Lp(a) at all study time points but no statistically significant changes in triglycerides. Specifically, a statistically significant increase was found at 60 months in total cholesterol [mean percentage change from baseline (PC) 5.27; p = 0.003], HDL cholesterol (mean PC 6.75; p = 0.003), LDL cholesterol (mean PC 10.02; p = 0.001), Lp(a) (mean PC 105.95; p < 0.0001). 103 (56 %) women in the study had clinically significantly elevated levels of Lp(a) (106 % above baseline) after 5 years of therapy. The results were similar after excluding the 21 % of patients who had ever received anti-lipid treatment. 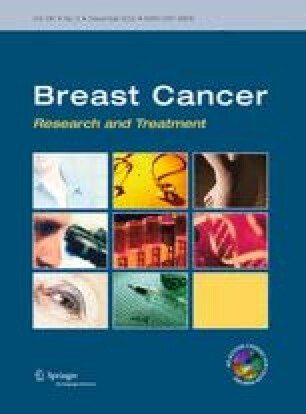 Significant increases in total cholesterol, HDL cholesterol, LDL cholesterol, and, most notably, Lp(a) in postmenopausal women were observed following 5 years of adjuvant letrozole treatment and after 5 years of tamoxifen therapy and such patients should have monitoring of their lipid levels in clinical practice. This study was supported with a grant co-sponsored from the National Cancer Institute of Canada and Novartis (MA.17L; lipid sub-study). The authors would like to thank all the women who participated in this study, the investigators of the NCCTG and NCIC CTG and Catherine Elliot and Curtis McMahon who managed the data collected for this trial. PEG is supported by the Avon Foundation, New York. This is original research which has not been published elsewhere. PEG has received speaker’s honoraria from Novartis and KMW has received research funding from AMCOL International Inc. and iCo Therapeutics Inc.